"Minnesota’s increased regulations and taxes have pushed many producers to relocate in South Dakota." So now I'm to fear South Dakota? Come on, are they really that dangerous? Sure Ole went there one winter to hunt and ice fish... but he came back home without problems. And I'm not aware of their state's campaign to invade Minnesota. Will South Dakota demand to change all the street names in Apple Valley from flowers to farm animals? I did notice they signed on for the federal stimulus funds ...and they got $39.5 million in state fiscal stabilization funds from the U.S. Department of Education even with a GOP Governor! But nowhere did I find evidence that South Dakota is taking our jobs! Maybe that is where the 100K waitress jobs are? Hey now, South Dakota here I come..er...guess not! This is where Emmer's logic fails, Minnesotans are a brave lot, they face winter each year, looking forward to the worse mother nature can hand them, let South Dakota take their best shot at us...we've seen worse. AND WE AREN'T AFRAID! 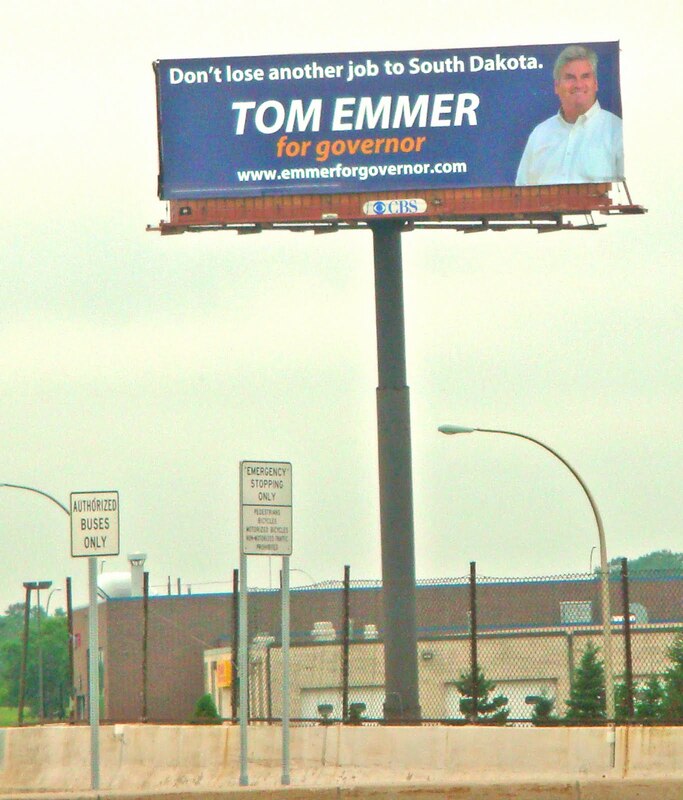 What's next in Emmer's campaign of fear?...a billboard warning us of Wisconsin? Canada? Iowa? or maybe the real bogeyman is North Dakota? Being afraid really helps Emmer in November or why else vote for him? Better yet, get real and vote Mark Dayton who's not afraid of our neighbors....It's called Minnesota Nice and most of us have it. Here's the deal, we grew up, became adults and left the bogeyman thing behind us. Guess Emmer has some growing up to do. Have you seen the "puck stops here" billboards on 35E or 10? Emmer in a softball uniform holding what appears to be a cartoon hockey stick... It's terrible.